Shielding your home is important, but shielding your wallet is equally important. 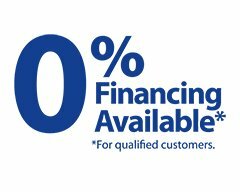 In the pursuit of offering exceptional experiences to our customers, we are pleased to provide 0% financing. No payments for 12 months for qualified customers. You’ll be able to get that new roof, those new windows, or that beautiful new siding when you really need to. We’re so intent on making it seamless for you that we will even coordinate your financing right in your home when you’re ready. Financing offer valid at time of presentation only.